Parkinson’s disease (PD) is one of the most common neurologic disorders, affecting approximately 1% of individuals older than 60 years.1 It is thought to have complex etiologies, including a combination of genetic and environmental causes. In addition, there are no proven strategies for preventing or curing PD. However, identifying risk factors for PD can help scientists develop future strategies for disease prevention and treatment. 1de Lau LM, Breteler MM (June 2006). “Epidemiology of Parkinson’s disease”. Lancet Neurol. 5 (6): 525–35. PMID 16713924. doi:10.1016/S1474-4422(06)70471-9. 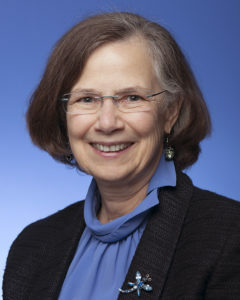 Caroline M. Tanner, MD, PhD, FAAN, is the Director of the Parkinson’s Disease Research, Education and Clinical Center at the San Francisco Veterans Affairs Medical Center and Professor of Neurology at University of California, San Francisco. Her clinical practice specializes in movement disorders. Her research interests include investigations of the descriptive epidemiology, environmental and genetic determinants, biomarkers, early detection, nonmotor disease features and interventions for the secondary prevention, disease modification and symptomatic treatment of movement disorders and neurodegenerative diseases. Dr. Tanner and her colleagues have identified associations between exposures including certain pesticides, solvents and persistent environmental pollutants and increased risk of Parkinson’s disease, and a greater risk in individuals with certain genetic variants (gene-environment interaction). Dr. Tanner is also the past co-chair of the Parkinson Study Group (PSG) and has conducted numerous clinical trials with the PSG and other groups. Her other research interests include facilitating collaborative research and improving patient access to research and clinical care, both locally and internationally, including telemedicine, use of mobile technology and patient-reported outcomes. An additional area of focus is the identification of PD-associated biomarkers (Parkinson’s Progression Markers Initiative, LABS-PD studies). She currently serves on the Scientific Advisory Boards of the Michael J. Fox Foundation and the National Spasmodic Dysphonia Association, on the Linked Clinical Trials Committee of the Cure Parkinson’s Trust and on committees for the NIH, the International Parkinson’s Disease and Movement Disorders Society and the American Academy of Neurology (AAN). Her honors include the AAN Movement Disorders Research Award in 2012 and the White House Champions of Change for Parkinson’s Disease in 2015.